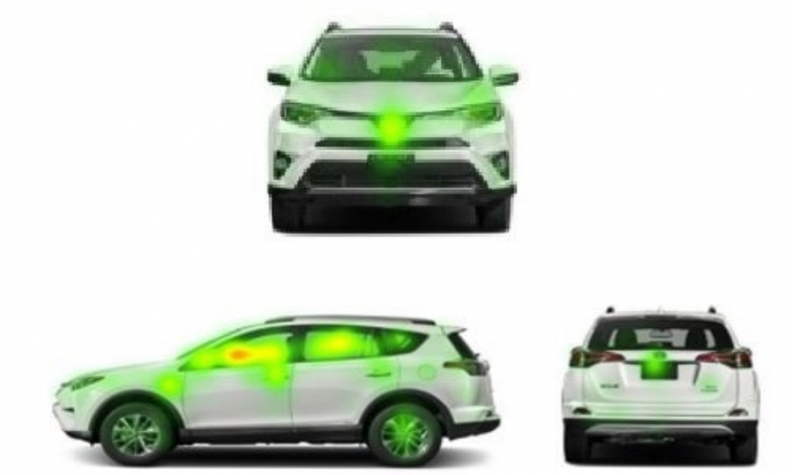 Eye tracking research from Tobii Pro Insight reveals what catches a shopper's attention, mainly it's the vehicle's exterior. Shiny new vehicles undoubtedly remain the stars when people are new-car shopping, but automotive brands only have a 20-second window to influence a consumer's opinion in a busy showroom setting filled with promotional material and displays, according to a new study. Toyota Canada, along with eye-tracking provider Tobil Pro, drew their conclusions from a simulated Toyota showroom, complete with a Corolla, RAV4 and a variety of promotional materials, at the Dx3 Canada technology conference back in March. The three organizations released the results of the study Monday. They found dealers should be aware that the consumer’s attention span is shortening and not all promotional material is treated equally. The wearable eye-tracking glasses found that while consumers looked at everything from the vehicle to interactive digital displays, signage, imagery, commercials and brochures, people didn’t spend much more than a few seconds on each of them. Participants spent close to 60 per cent of their visit viewing the exterior of the vehicles, focusing on the driver’s side door. Once inside the vehicle, the consoles, gear shifts, and instrumentation took the greatest share of the participant’s attention, with close to 70 per cent of their time spent on the features. There wasn’t much attention given to the hood of the car — or what’s beneath it. The study found all printed promotional material was seen. They captured attention, but – aside from the “Safety Tower,” which was filled with content on vehicle safety features – not for long enough to have a great impact. The “Safety Tower” was among the most viewed features. Interactive displays, like touchscreens and televisions had a high level of engagement, especially among millennials. Millennials gravitated to the interactive displays found close to the vehicles, while older shoppers viewed the textual elements of the display with greater attention. “You need to find methods for communication that are direct enough to communicate with the younger audiences, especially as they become the core car-buying market,” said Mike Bartels, Tobii Pro Insight’s senior research director. Toyota Canada didn’t immediately respond to inquiries from Automotive News Canada.